Is It Cerebellar Hypoplasia or Cerebellar Abiotrophy? If you thought the science behind cerebellar hypoplasia was complicated, just wait. I recently read about another condition that is so similar to CH that it is often confused for cerebellar hypoplasia. Consequently, there are times that vets sometimes diagnose this condition as CH, when it’s really not. 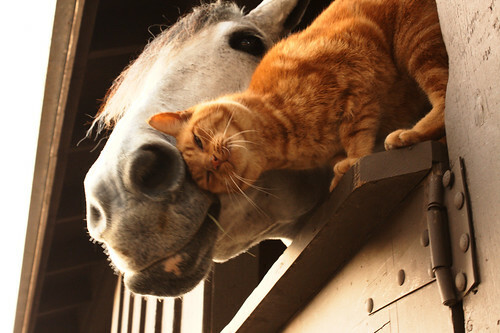 It’s a disease that’s found in horses and dogs, much like CH, but it can also occur in cats, cattle and sheep, too. The condition’s symptoms are similar to CH, but the important difference is what causes this condition and when. As you may know, cerebellar hypoplasia is a congenital condition resulting in the underdevelopment of the cerebellum, which is caused by the feline distemper virus or trauma while in utero. By and large CH occurs before a kitten is born, although there have been known to be a few exceptions. Meanwhile, cerebellar abiotrophy is another type of cerebellar degeneration that occurs after the animal is born. 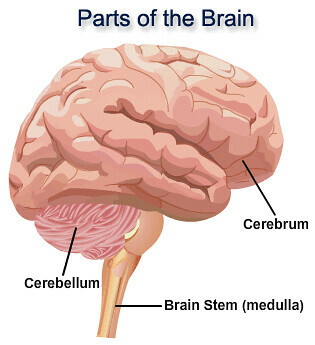 Cerebellar abiotrophy occurs when there is a loss of Purkinje cells in the cerebellum. These Purkinje cells, which affect balance and coordination, die off. These cells are important because these cells allow the cerebellum’s different layers of the brain to communicate with one another. When they die off, that communication stops, and the animal can lose its sense of space and distance, as well as impacting its balance and coordination. If an animal has this defect, his Purkinje cells usually start to die off right after birth. The condition is usually noticeable before the animal is six-months old, although sometimes the cells die off more gradually, and an animal can be much older before the condition’s characteristics are noticeable. Some of its symptoms include: ataxia, a wide-leg stance, and head tremors, which sounds a great deal like CH. But there are other symptoms that are more specific to CA, such as: hyperreactivity, lack of menace reflex, a stiff or high-stepping gait, jerky head-bob movements while in motion, poor depth perception, and a general inability to determine space and distance. It sounds like the symptoms may worsen as the disease progresses, but some say it can stabilize over time. Like with CH, some animals with CA may actually learn to compensate and improve over time. Similarly, like CH, CA does not impact intelligence, and most animals can live out a normal lifespan. Our vet dx’d our 2 kittens with CH but he admitted that this was the 1st time he had actually seen CH – and he wasn’t sure. Since symptoms are the same what tests are needed to be performed to tell the difference? Hello Amanda, Thank you for your response -unfortunetly we lost one of the kittens this morning. He became severly constipated and he died while at the vets. X-rays were taken and it appeared the he had a major bowel obstruction. There was no way we could have seen this coming . Although we only had him for 3 weeks he is already missed. His sister however is striving so far. They were approximately 6 weeks old and born to a feral mother who has made herself and her 2 other kittens at home in our garage. I will check out the links. Again Thank you for your response. Hi Monika – I’m so sorry to hear about the kitten. I’m glad he was able to spend his final days with someone who cared so greatly for him. Hello again Amanda, I just wanted to let you know to tell your readers that if ever you are not totally comfortable with your usual vet’s d,x to get a second opinion, even if it costs a little more. It will save heartbreak and money in the long run. Unfortunetly there are not enough vets around that know what CH is and how to deal with this. That was the problem in our situation. Apparently there is not enough info or training with this type of situation. We found that due to your website that we knew more than our vet. That is so sad if you know what I mean. Because we were afraid of what had happened to the male kitten we took the female sibling to another vet to have her checked out MORE thoroughly because she had an unusual urinary discharge. The r original vet stated he had no idea what it was. He thought it might possibly be a “tape worm” …. HUH? It is such a relief to have finally found an article that mentions cerebellar abiotrophy (CA) in cats as there seems to be so little information available. My 5 year-old rescue cat, Elvis, was diagnosed with CA on MRI scan over 2 years ago. The scan was very expensive – 1700 GBP – but it was the only definitive test for this condition. The veterinary neurologist was unable to give a prognosis, only that there was no treatment and that he would deteriorate. Over the last two years his condition has indeed worsened, although he appears to have been stable for several months now. This certainly bears out the last paragraph of the article. Elvis can’t walk as his hind legs are not strong enough to support him. However, his front legs are fine. He can drag himself to the litter tray and to his food and water bowls without too much difficulty and with no pain or discomfort. He retains a huge zest for life (when he’s in the mood he is the best snuggler!) and he absolutely loves his food! This is all despite his other health problems – he has one eye (the other eye apparently became infected due to cat flu when he was a kitten and his owner rejected him) and occasional bouts of E. coli. Elvis is the most stoic of cats and I am very proud to be his servant! After 4 years of searching and countless vet visits and treatments (including my brother who is also a Vet), I’ve finally located was is/has been plaguing my cat George. He has EVERY single symptom of CA….from the high stepping gait, to the wide stance etc. Consenscious was an auto-immune disorder which I understand as being a nice way to say “we don’t know”. I am beyond relieved and can with confidence move forward in relieving him (along with the support of my current veterinary care) of unnecessary medication (i.e. steroids) he has been exposed to for the last few years. Thank you so much for this invaluable article. George and I are beyond grateful.